Walter Masuda and Shawn Frederking presented an outstanding Reading Apprenticeship Workshop in mid-October at Diablo Valley College. Community college faculty from nearly a dozen Northern California community colleges were in attendance. 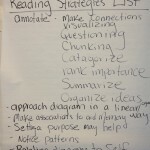 Together we explored our collective reading process and generated a list of reading strategies we used in reading several texts throughout day. 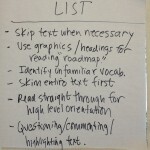 The lists grew as we practiced a variety of Reading Apprenticeship routines ideal for all class settings. After lunch, Walter and Shawn helped us all discover the ways in which our texts present challenges to our students. With a partner, we examined other’s course texts through a think aloud activity, which revealed to our partner the challenges the text presented because it required certain types of knowledge for complete understanding. Once we unveiled our individual “expert blindspots,” we worked with our reading partner to categorize the types of knowledge readers need to acquire in order to read the text successfully. 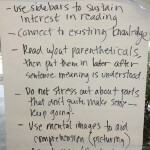 We discussed the world knowledge, text knowledge, discipline knowledge, and reading strategies students need and how to scaffold instruction to assist them in acquiring these knowledge types. 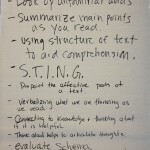 From the first strategies list to the last word shared in our final group discussion, presenters and participants eagerly explored ways to deepen and broaden their own instruction to support students in their college level literacy experiences.